This came along a random thought the other day. What’s the record for the longest day trip ever taken? No, I’m not talking about some of those crazy 24-hour “drive like mad” county-counting (or state-counting) “trips”. I’m simply talking about the longest A to B and back to A trip that occurred over the waking hours of the day and set aside time for sight-seeing (or something of substance taking place) in point B. So I, the utmost authority on weekend road trips, figured I’d standardize the qualifications for taking your own extreme day trip. I’m not talking about driving an hour or two out of one’s way, I’m talking at least five hours or more, both ways, maybe crossing multiple state lines in the process. Sound like pure hell? Good. Really, only those who love the road should apply here. Taking a look at my personal record book, my best for a day trip was driving from the D.C. area to Kitty Hawk, N.C. in one day and back. In Kitty Hawk I had just enough time to eat at a seafood buffet and see the beach before turning home and making it in just shy of 11 p.m. (I started my drive around 9 a.m.). Seeing as it was a Sunday, beach traffic heading back to D.C. that night was brutal and nearly put this day trip into the next day! Total mileage = 554. 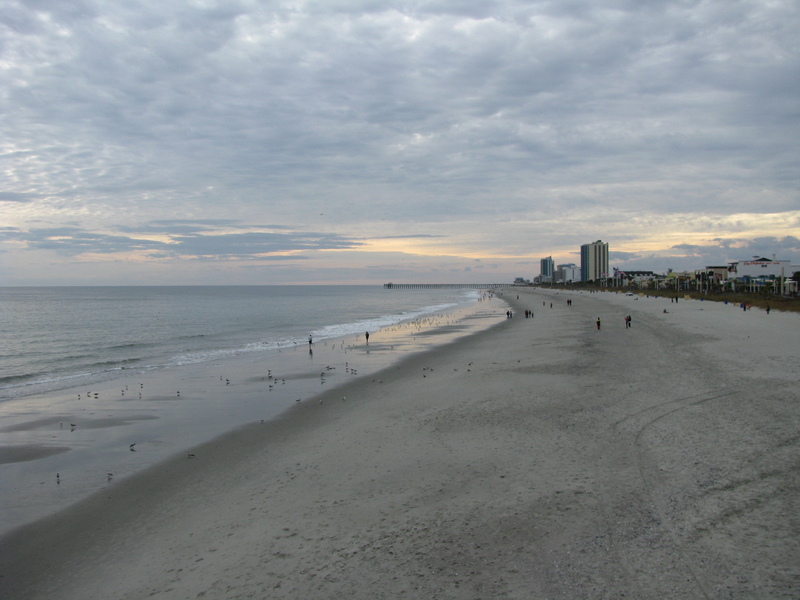 The above picture isn’t Kitty Hawk (it’s Myrtle Beach) but beaches seem to be a prime destination for day trippers! Of course I’m always looking for an excuse to break new ground in the annals of day tripping history. Going 300 miles out (before heading back) shouldn’t be too hard to do. But before I start spitting out ideas, we have to set some rules. What makes for an extreme day trip? I thought about setting the mileage at 600 for the day, but 550 is a good number as the former would really limit one to being almost exclusively on the interstate. Multiple destinations are perfectly fine, but it’s important to make sure you end where you began. Of course, multiple stops could make it difficult to hit the mileage count! You must be back where you began the trip by 11:59 (and 59 seconds) p.m. of that same day. One minute over and you’ve technically made it a two-day excursion. You must leave no earlier than 6:00 a.m. If you do leave earlier, you must deduct that from the final time (trips leaving at 4 a.m. must return at 10:00 p.m.). Why? I’m not promoting tired heads being on the road, and allowing 24 hours for a day trip is certifiably insane. No speeding! Despite the long haul of an extreme day trip, it’s just that, a trip. Slow down and enjoy the road. So that’s it. If any of you want to take this idea and run with it, feel free. I’m curious to see who else loves driving as much as me to undertake (or already has tried) an extreme day trip like this. Feel free to post your experiences or thoughts in the comments. Posted in North Carolina, Washington D.C.
I’m not even sure I can pull off the extreme day trip without really compromising the whole point of travel for me and slowing down to appreciate whatever locale you visit. I would definitely put your side excursion up there as an extreme drive contender, Tom. You not only incorporated a destination, but had purpose and meaning to the entire drive – picking up states and counties along the way! Sounds like a fun, full day to me.